Imagine white sand beaches, blue waters and dazzling panoramas of the ocean right from the comforts of your bedroom villa. If you are in search of a seafront paradise to relax your honeymoon away and recuperate from the daily grind, the great news is we have found just the perfect hideout for your peaceful escape! 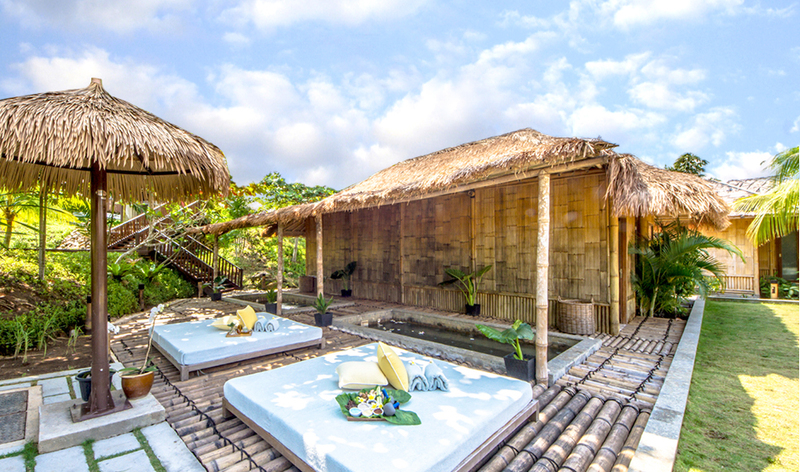 Featured in our Top 10 Most Romantic Hotels in Batam, we take you on a journey to explore one of our top picks – Montigo Resorts, Nongsa. Known to share a resemblance with the stunning Santorini in the Greek Isles, Montigo Resorts, Nongsa enjoys scenic landscapes, breathtaking views, spacious villas and contemporary amenities. Best yet, it a stone’s throw away from Singapore – you can get there in just a 30-minute ferry ride! For those who are not keen on spending hours on getting to your destination, this blissful getaway is an ideal choice for you. Apart from being a tropical paradise for a romantic honeymoon, Montigo Resorts, Nongsa is also an ideal venue for a dreamy beach destination wedding. Read on to find out more about the dreamy escapades that this resort island has in store for you. This spot is definitely not to be missed! For couples wanting to take your wedding to the next level, Montigo Resorts, Nongsa offers you impeccable sea views, stunning sunsets and romantic dining. The pristine seascape alone will have your guests swooning over the dreaminess of it all. Your beach solemnization will be a dream come true! But on top of breathtaking scenic backdrops, Montigo Resorts, Nongsa also has customized wedding themes for groups as intimate as 10 and as large as 250. After your solemnization, you can opt for a romantic sunset dinner on the beach, or head to their expansive Madura ballroom where you can dine in indoor comforts. The ballroom and private rooms are equipped with some of the latest audio and visual equipment for impactful presentation. Everything you need to impress your guests is prepared for you, so rest assured that your guests are in for a unique and delightful treat! For an intimate ceremony, wedding packages stars from $2,388. It includes a 2-night stay in their deluxe two-bedroom villa where you can indulge in unobstructed panoramic views of the South China Sea. The package also includes express immigration clearance at the Nongsapura Ferry Terminal, Montigo Bridal Spa Rituals for two, floral decoration for the bridal suite, bridal bouquet, two-tier wedding cake, and a personalized butler service! Your family, friends and wedding party can stay in villas near you and will be ferried to your solemnization ceremony via a buggy. For a bigger celebration, the rates are reasonably priced from $65++ to $85++ per person. You can choose to host it indoors at Madura Ballroom or outdoors at the Sand park right by the jetty. Outdoor weddings at Montigo Resorts, Nongsa will have you at ease, for in the event of rainy weather, the resort will automatically shift your event to the Madura Ballroom venue. This is so you can have as little to worry about on your big day! A plus point is Montigo Resorts, Nongsa has a sales and marketing office right here in Singapore (see address at below of post). This allows you to discuss your marital arrangements without having to cross the border at all! Though, a site visit prior to your event is always recommended. You might be familiar with Santorini’s iconic views – endless seascapes and vast blue skies from whitewashed buildings perched on the cliffside. And guess what! The views of Montigo Resorts, Nongsa shares a striking resemblance with the iconic postcard views of Santorini! The white and blue hues of this gorgeous modern seafront resort aim to provide a relaxing ambience and reconnect you with nature. After crossing one of the biggest milestones on your wedding day, celebrate it with a seaside honeymoon in this beautiful resort. The Deluxe two-bedroom villa features a bleach-accented sky terrace on the top floor, which conjures up breathtaking views of the South China Sea. After settling into the comforts of your private villa, you can even experience a private barbecue dinner on the rooftop of your private villa. This barbecue dinner is like no other – it is accompanied with elegant furniture and table settings! Watch as the chef whips up brimful plates of surf and turf grills, such as rosemary lamb chops, king prawns and basil snapper fillet! You can also order from their in-villa dining menu here. 3. Incredibly spacious and luxurious villas – up to 1,816 sqm! Montigo Resorts, Nongsa has gone the extra mile to ensure that you get to enjoy your privacy in ultimate comforts. With the addition of new Premier one-bedroom villa and Premier five-bedroom villa, resort now has over 100 villas and will progressively add more to meet growing demand and to cater to unique needs of different market segments (e.g. Premier one-bedroom villa for honeymooners/babymooners, Premier five-bedroom villa for larger groups / private events). They have recently launched the Premier five-bedroom villa accommodation type which has a sprawling plot area of 1,816 sqm in a private compound perfect for small events/solemnisation. The Premier five-bedroom villa is the closest accommodation type to the seafront with a larger private pool (vs other accommodation types) of 206 sqm and boasts 24-hour butler service. The private compound comprises a master, Premier four-bedroom villa, and a living room area that functions like individual villas. We took a closer look at the best accommodation Montigo Resorts, Nongsa has to offer and discovered that the Premier 4-bedroom villa is simply astonishing and incredibly spacious! Exclusive and exquisite, it makes an ideal spot to house your family or wedding party. Here, you can host engagement parties, intimate wedding dinners and more – the possibilities are endless! Be sure to allot some time to lounge at your private villa pool! It makes a great spot for overlooking the gorgeous scenery. Cool across every detail, TIIGO Beach Club in Montigo Resorts, Nongsa is a great place to unwind and relax. Accompanying you is the sparkling blue South China Sea and its uninterrupted views. Get ready to soak up the evening sun in their infinity pool whilst enjoying the comfort of the cabana beds. Lazily gaze out at the magical sunset with your favourite cocktail in hand – their menu features over 50 tempting cocktails and signature spirits, alongside a selection of delectable bar bites. Do not leave without having a taste of their signature TIIGO Burger! This place gets better upon nightfall as the resident DJ transform the space into a groovy atmosphere with his spins. It’s time to take out those dancing shoes! For karaoke lovers, there are private rooms for you to display your vocal talents too. After dancing the night away, be sure to book an appointment at the Montigo Spa. Here, even the weariest of souls will feel rejuvenated, for the Montigo Spa focuses on restoring your body’s balance with their therapies. Their signature treatments include the herbal compress massage, traditional facial, foot reflexology, hair cream bath, firming wrap, Javanese Lulur, Ginger bath and the couple spa treatment. However, Montigo Spa is undergoing a facelift right now (spa operations as normal at its temporary venue), there will be a new spa menu when the refurbishment completes. We recommend trying the Central Javanese Lulur scrub, which uses natural ingredients like rice powder, milk, turmeric and ginger, all grounded just minutes before your appointment to retain freshness and efficacy of its natural oils. Montigo Spa’s restorative treatments are mostly formulated without chemicals, so it is a refreshing experience for most, especially if you have sensitive skin. We urge you to opt for a full 2- hour session for complete indulgence! To wrap up the pleasant spa experience, we were served honey ginger tea and Indonesian cookies after the massage. For those who are fearful of getting massaged, not to worry as their treatments aim to personalize to your problem areas and strength preference. 2016 World Luxury Spa Awards! They also won recently the World Luxury Spa Awards for “Best Luxury Resort Spa” continent winner. Get ready to have your taste buds awakened. Food lovers will enjoy visiting the 3 restaurants in Montigo Resorts, Nongsa – Tadd’s and Pantai Restaurants, and TIIGO Beach Club where TIIGO’s concept is “BEATS, BITES, BUBBLY”, with relaxing seating (dining table mixed with sofa and poolside cabana seating). Inspired by the diversity of local flavours, have the team of experienced chefs at Montigo Resorts, Nongsa whip up a variety of satisfying cuisines for your delightful dining experience. Enjoy all day dining at Tadd’s, whether it is a casual lunch, a relaxing dinner, or a snack in between meals. Serving local, Asian and Western cuisine, relax in their semi al-fresco poolside setting. Be sure to try the Gado Gado salad and the Coconut Crème Brûlée. See their food menu here and drinks menu here. At Pantai, tuck into sensational seafood creations that are fresh, locally-sourced and nothing short of delicious. This intimate kelong-style restaurant will have you enjoying gentle breeze and the soft sway of trees during dinner. Kick start your meal with a refreshing winter melon chicken soup before diving into their black pepper mud crab. See their full menu here. TIIGO Beach Club, as mentioned is where meals, martini and music resides, and a great hangout spot upon evening or nightfall. There is no better way to celebrate the first days of your marriage than with a romantic dinner on the beach. You will be psyched to hear that Montigo Resort Nongsa offers you just the perfect spot for an intimate candlelight dinner! Available from Sunday to Friday, or make special arrangements with their team here. One of the highlights (and most popular) at Montigo Resorts, Nongsa is the Chef Experience. Embark on a hands-on culinary journey as you learn to prepare a menu of Indonesian home-style favourites using herbs you pick and fish you catch! Discover the transformation of fresh ingredients into creative and tasty dishes with the help of experienced chefs. If relaxing and lounging in the resort isn’t quite your thing, grab the chance to go on a bicycle tour or jungle trek to explore the island surroundings. Make the necessary arrangements with the front desk and you are good to go! Montigo Resort, Nongsa is ideally situated in Nongsa and you can enjoy easy access to the lively city. We thoroughly enjoyed our experience at Montigo Resorts, Nongsa. It was a peaceful escape from the busy city life, and it makes a special spot for weddings, honeymoons and anniversaries. The modern contemporary resort shies away from the traditional-style hotel designs, but it does not compromise on its warm Indonesian hospitality. We give this place a thumbs up, and recommend that you check it out for yourself! Simply hop on a ferry from Tanah Merah Ferry Terminal to Nongsapura Ferry Terminal, which will cost you S$49 for a two-way ticket. The ferry ride is about 30-45 minutes. Once you hop off the ferry, you’ll be greeted by the resort drivers who will get you to Montigo Resorts, Nongsa in five minutes. Click here to book your stay at Montigo Resorts, Nongsa today! This post was brought to you by Montigo Resorts, Nongsa.